Machine learning is one of the hottest areas of development, but most of the attention so far has focused on the cloud, algorithms and GPUs. For the semiconductor industry, the real opportunity is in optimizing and packaging solutions into usable forms, such as within the automotive industry or for battery-operated consumer or IoT products. Inefficiencies often arise because of what is readily available, and that is most certainly the case with machine learning. For example, GPUs have been shown to be the highest-performance solution for training. Because these devices are based on floating point, then machine learning algorithms are developed that rely on floating point. Inferencing in edge devices cannot afford to use floating point, and it is necessary to transform the coefficients into fixed point. But could training be done using fixed point? Quite possibly, although special-purpose hardware is only starting to be considered. It’s not clear if algorithm development and tools are too entrenched to move, forcing the industry to continue along an inefficient path similar to general-purpose software. The big question is whether the industry heading toward another hardware-software divide. It may manifest itself as a cloud/embedded divide this time, unless something can be done to bring the two sides together. Most algorithm development is focused toward the cloud, and much of that assumes inferencing also will happen there. The computational power needed for inferencing is a fraction of what is required for training and thus gets little attention. 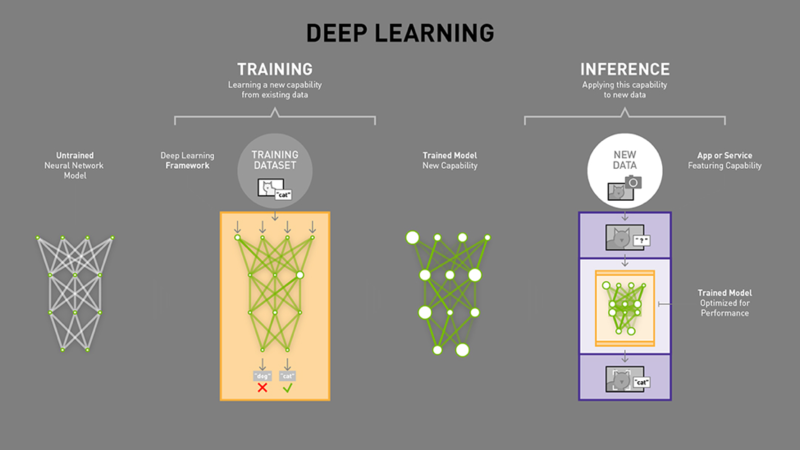 Overall, real applications—even ones that heavily leverage machine learning methods—consist of many other parts. Rowen’s list includes image preprocessing, image scaling, MPEG decoding, image and video clipping, region of interest selection, motion detection, background deletion, histograms, transcoding, segmentation, database access, data formatting, smoothing, noise removal, data augmentation, face detection, FFT, frame-to-frame tracking, I/O processing, and sundry stitching together of complete processing pipelines. This means that many of the hardware solutions today are a combination of technologies, deploying vector processing and neural networks tightly coupled into a combined accelerator engine. Also, like many other hardware solutions, there are plenty of tradeoffs to be made. You could do something in an ASIC, and this would provide the lowest power and smallest area. But what if you want to future-proof your product? Now you want programmability. The industry is looking for ideal solutions in a rapidly changing environment. Latency depends upon the application domain where it is possible to have long latency, in the order of seconds, for some real-time applications—so long as the throughput is adequate. In other applications, especially with direct human interactivity or in safety-critical systems like automotive and robotics, you may need latency measured in milliseconds or tens of milliseconds. For machine learning there may be additional metrics that have to be considered. These include accuracy and future proofing. Power is one of the biggest tradeoffs for machine learning, and bandwidth requirements create limitations. It is the responsibility of the hardware community to help close the divide. Software has taken the lead and that industry can justify their investments without consideration of processing at the edge. The hardware industry may not be used to being in this position, but if they want to see changes made, they will have to start making the investment. Personally, I’m seeing more of a convergence of things I’m familiar with – a lot of neural network processing is a similar code pattern to circuit simulation (behavioral analog, fast-SPICE). A language like Verilog-AMS can easily be used to describe neural networks. You can even use “flow” for reinforcement feedback. There’s a cognitive dissonance for the guys above because they are all digital, probably hate analog, and don’t see the connection. Can’t see them crossing any divides myself. I had to chuckle – yes, the analog/digital divide has existed ever since the transistor was invented. I would love to see some work on analog machine learning. I am sure it would be a tiny fraction of the power. CNN/DNN research is evolving so quickly that future-proofing the hardware is fundamental. A fully hardcoded NN will quickly become obsolete and is not the way to go. Programmable HW accelerators provide a lot more flexibility, but even they can’t anticipate the structure and operations of future networks. This is why HW accelerators need to be extended through SW to handle operations not supported in HW. Lastly, and perhaps most importantly, I am surprised that FPGAs are not mentioned in this discussion. They are gaining momentum in the data center (Microsoft, Amazon, Huawei…) and they are present in many embedded/IoT products. They provide the ultimate flexibility, including the ability to reprogram the NN accelerator to take advantage of the latest advances in NN research. Inference precision has quickly moved from 32bits to 16bits and now 8bits. 4bits and below are in sight. CPUs/GPUs/HW Accelerators have fixed datapath and cannot easily take advantage of this evolution, unlike FPGAs. *Note: all the above applies to inferencing, not training. You are right about FPGAs. For inferencing, eFPGAs are more likely to be the direction people want to go and I will be talking about that in an article about mapping in February. I do expect to see eFPGA chips being released in quantity this year.